Video (01:00) : Coach Bruce Boudreau discusses the 3-0 loss to the Ducks on Thursday. Winger Nino Niederreiter reported to Xcel Energy Center Thursday morning to prepare for the evening’s game with the Ducks, participating in the morning skate before leaving to rest up. 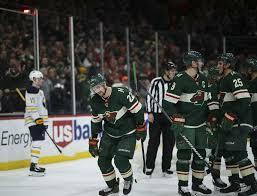 But after the Wild was flattened 3-0 by Anaheim, the stall that Niederreiter once occupied was already set up to welcome center Victor Rask – the player the team acquired in exchange for sending Niederreiter to the Hurricanes. Niederreiter was one of the longest-tenured players on the Wild, joining the team via trade in 2013 from the New York Islanders. He went on to log 434 regular-season games with the team and another 39 in the playoffs, skating as a favorite among fans and his teammates. Although General Manager Paul Fenton has been mostly idle in the trade market since joining the organization last May, it seemed inevitable he would eventually make a move. But players can still be caught off-guard by the news. If the team doesn’t start to consistently win, players expect more subtraction will occur. And preventing that is their objective. Despite being was scheduled to have the night off with Stalock starting, Dubnyk came on in relief against the Ducks – turning aside all 15 shots he faced after Stalock was tagged for three goals on eight shots less than eight minutes into the first period. Falling behind early was the latest poor start in a string of them this season for the Wild, a trend that mystifies coach Bruce Boudreau. New winger Pontus Aberg skated 15 minutes, 18 seconds in his Wild debut, putting two shots on net.